Mozilla is the Open Source version of Netscape. As such, much of it will be very familiar to Netscape users. You should read Mozilla.org's Mission Statement and related pages to understand the somewhat complicated relationship between Mozilla and Netscape. I first tried Mozilla when it was at version 0.7. Although the browser itself was pretty good by that point, the rest of it (mail and news) was still too badly broken to use. The 4.77 Netscape I was using on my Linux box was pretty sad too, but it was far better than Mozilla. Still, I had seen enough that I liked to want Mozilla. When it reached version 0.9.7 on December 21st of 2001, I downloaded it for another look. I didn't really expect perfection, and of course I didn't get it either, but I am happy to say that at this release, it's more than "good enough". Mozilla is now very usable, has very few problems left worth complaining about, and is unquestionably a vast improvement over Netscape 4.77. Like Netscape, Mozilla integrates browsing, email and news. Some people don't need or care for that and would prefer to use other email and news clients. If that describes you, you'd probably like Opera or Galeon better. If, however, you prefer the integrated environment (I do), then you should give Mozilla a test drive. I have now scrapped Netscape 4.77 and am using Mozilla exclusively. The first thing you'll notice about the browser is that it is fast. 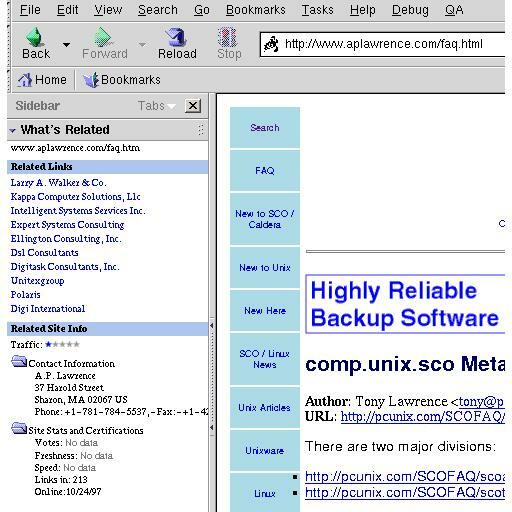 Netscape has historically been slow with tables, but pages with large tables just seem to snap into view with Mozilla. Netscape 4.77 just couldn't handle some pages at all- they'd appear to be totally blank- I've tested all that I was personally aware of with Mozilla and they now work. Graphics are rendered more quickly also, and the difference is definitely noticeable. I have noticed a few pages where Mozilla leaves some artifacts on the screen under certain conditions; a reload usually clears these up. There are apparently some HTML sins that Netscape gracefully ignores that Mozilla does not; I found one of my own pages that just doesn't look quite right with Mozilla (Netscape and IE render it correctly). It's a fairly complex page and I haven't yet dug into it to see where the problem lies, but my bet is that it is my own sloppy HTML that is misleading Mozilla. The result is nothing new if you are accustomed to Microsoft browsers: the icon shows up in the URL bar (it will also show up next to bookmarked favorites). 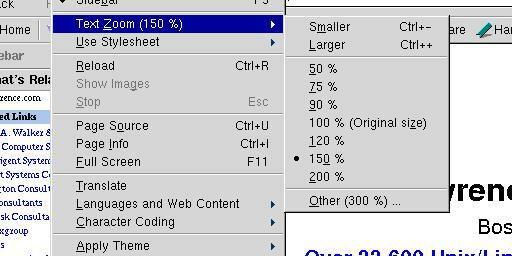 If you've been frustrated by Netscape 4.77's inability to adjust text size on the fly, you'll be happy to see Text Zoom on the View menu. The "What's Related" is supposed to be helpful, and perhaps it is for some sites, but I haven't found it to be very accurate. The site specific information for the current page is, I guess, interesting, and you can probably trust the Contact Info, but the rest of it is fairly suspect (based on what I know about my own site and what it tells me). S/MIME support is new for this version. If you don't know what that is, and were using Mozilla, you could highlight "S/MIME Support", and then right mouse click for a context menu that would include "Search for S/MIME support". If you had already set your preferred search engine to Google in Preferences, selecting that would initiate a Google search for that text (where you'd learn that S/MIME has to do with Mail Security). A "Print Preview" menu choice is interesting, but I must miss the point: it shows you where pages would break, but what good does that do? The built-in Help mentions "Print-Plus", but only mentions the words; no description is given. Mozilla has some support for form completion, but again I may not understand their intent correctly, because I don't see it as being very useful. Apparently it can "learn" about forms by watching you fill them in and can then eventually do the work for you. Frankly, I like Opera's take on this much better- a context menu that lets you paste from data fields you have stored. But I may be not understanding this perfectly. 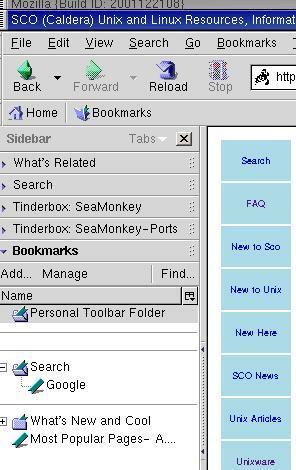 The History Tool (Tasks->Tools->History) is much different and much improved from Netscape 4.77. The quick browser rendering also passes over into mail and news. I deplore HTML mail, and it's even worse when it downloads pictures, but unfortunately Microsoft and AOL have made this stupidity all too common. The fact that it downloads and renders more quickly is at least some comfort. What's my gripe with HTML mail? Two things- first, it takes up more space and takes longer to download than simple text. You may not notice this if your email use is light, but for those of us who get dozens and even hundreds of messages daily, this stuff adds up. Secondly, the results aren't always what you saw when you sent it- what looks great in your Outlook Express compose window may be completely unreadable on my screen: 3 point purple font on a gray background, for example is one I get fairly regularly from Microsoft users. This version lets you define multiple POP accounts. Each account is managed separately. Mail filters are also specific to each account- I'm not entirely sure that's necessary or even good; if I did want to discriminate based on what account mail came from, why wouldn't I just make us of the "To:" field to do so? One new feature I really do like is labeling of mail and news. This feature marks messages with one of five different colors- you define the colors and what they mean to you in Preferences. You might define Blue as Personal, Red as Urgent, Blue as Business, etc. You can then sort by these labels so that all the Blues are together and so on. I'm using that to help organize the constant back-log of messages that haven't quite been resolved yet or are waiting for something else to happen before they can be filed away permanently. This is, in my opinion, a pretty useful feature. I have no interest in chat, so I didn't test this at all. Please keep in mind that the development of Mozilla continues along at a rapid pace. Issues I mention here may be fixed in the next release, and because I'm never in a great hurry to upgrade, I may not know about it for quite a while. Therefore, these problems were present in the 0.9.7 release of December 21 2001. Newsgroup article sort order reverts to "Order received", will not stay as "Threaded"
Sub-folders in pick-lists (as you'd see when using the "File" button) should sort alphabetically but do not. My outgoing SMTP server name was overwritten with a bogus name after telling POP to automatically download new messages. I don't know if this is a bug or a deliberate design choice, but I find it annoying that I can't directly type a path into the Save As or Open File dialogs- you have to navigate with the mouse to the directory you want. The Java plugin doesn't quite render all applets as it should. It's close, but not perfect. Therefor, a particular applet may or may not be usable. There are other bugs- you can find many of them already listed in the 0.9.7 Release Notes; if you are reading this much after December 2001, many of those will have already been fixed. As mentioned above, I've seen some page rendering ugliness here and there, and even had one crash while reloading a page. This is not perfect, at least not yet. It's now December 2002. I'm up to Mozilla 1.2.1, and am pretty happy. I do get some strangeness now and then: refusing to start, refusing to post or save files, all the while sucking up more and more memory and cpu time, but I've found it's easy to fix by removing Mozilla's XUL file. Do a "find $HOME -name 'XUL*' to find it, and simply remove it while Mozilla is not running and restart.